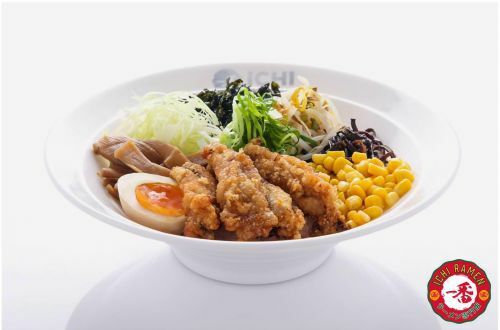 Menulog delivers for Ichi Ramen so you'll be able to track your courier on a map. Our original broth served with braised egg, bean sprouts, black fungus, bamboo shoots and spring onion. Our original chicken broth served with braised beef ribs. Soy based vegetable broth seved with egg noodles, seasoned bean curd and seasonal greens. Our original chicken broth served with assorted seafoods. Our original tonkotsu broth served with thin noodles, braised chicken, pork belly and beef rib and bok choy. (Our Signature Ramen). Our original tonkotsu broth served with thin noodles, pork belly, braised egg, black fungus, bean sprouts, bamboo shoots and spring onion. A classic Hakata-style Ramen. (Tokyo Shoyu). A rich chicken broth served with egg noodles, braised chicken, braised egg, bean sprouts, corn, bamboo shoots and spring onion. Our signature noodles tossed in a sweet soy sauce served with braised egg, black fungus, corn, bamboo shoots, Asian salad, seaweed flakes, spring onion and mayonnaise. GF = Gluten Free and V = Vegetarian. Pork or vegetable. Traditional pan-fried juicy gyoza. Prawn spring roll served with sweet chilli sauce. Served with BBQ mayo and shaved bonito. Ichi's signature fried chicken. Original crispy battered chicken ribs served with mayo. Ichi's signature fried chicken. Original crispy battered chicken ribs tossed with chilli sauce and cashew nuts. Grilled eggplant with sweet red miso sauce on top. Deep fried school prawn tossed with spicy mayo served with lemon zest. Traditional Japanese seafood pancake with BBQ sauce, mayo and shaved bonito. Grilled Japanese Mackerel Fillet served with Japanese pickles. Crispy battered calamari legs served with spicy mayo. Geso Karaage, Spicy Mayo Prawn, Mixed Sashimi, Prawn Twister, Edamame and Takoyaki. All bentos are served with house salad, miso soup, rice and a variety of appetisers. GF = Gluten Free. Crispy pork fillet dressed with tonkatsu sauce. Tender sliced pork wok tossed with house spicy sauce. Pan-fried chicken pieces coated with teriyaki sauce. Thinly sliced beef tossed in house BBQ sauce. Ichi original chicken karaage with mayonnaise or spicy chicken karaage. Grilled eel with kabayaki sauce. Choose any main dish (Unagi extra $2) served with mixed tempura and sashimi. Specialty fried rice with egg. GF = Gluten Free. Tofu, mixed lettuce, tomato, wakame, cucumber salad with wafu dressing. Cucumber, tomato, avocado, corn, mixed lettuce, pumpkin seed, soba noodles served with goma dressing. Grilled spiced lamb fillet, chilli, mixed lettuce, tomato, cucumber, coriander, cashew crumbs served with yuzu dressing. Cured salmon pieces on lettuce, leek, onion, tomato, avocado, snowpea sprouts served with truffle ponzu. Ichi's special tea with your selection of fruity flavours. Hot and cold option available. Ice fresh watermelon juice wiht lychee. Ice calpis water with fresh mixed berries. Citrus yuzu juice with lemon soda and bitters. Coconut water with a splash of lychee. Bring your energy back! Red bull, orange juice and blue curacao with bitters. Yuzu sorbet with tonic water. Ice calpis water with fresh strawberry and kiwi. Fresh mango ice crush with a blend of passionfruit.